Since we packed out, we are living the high life with the Embassy Welcome Kit. Welcome Kits can vary by post, but they are intended for pretty short term use. We’ve been using ours for over two weeks, and it can be frustrating having just one dish towel and four forks. Every day is an adventure when you go to make food and realize you are missing at least one essential item. The very first problem I encountered was the bowls. 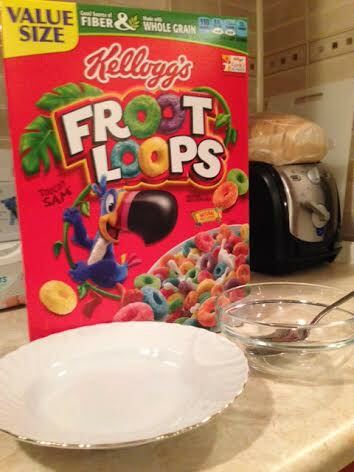 I love, love, love cereal, and it just so happens I have one last box of Froot Loops to enjoy. The provided bowls are super shallow and definitely not intended for cereal. No worries, I’ve been using this random glass bowl they included for an unknown purpose. When JR wants cereal for breakfast, we eat in shifts and wash out the bowl in between. Teamwork! The bowl on the left is the wee one which is about an inch deep. No good for cereal! Just before pack out, I had a breakthrough in the kitchen and made pizza dough from scratch for the first time ever. It was so good – and so surprisingly easy – that I made a second batch and tossed it in the freezer. 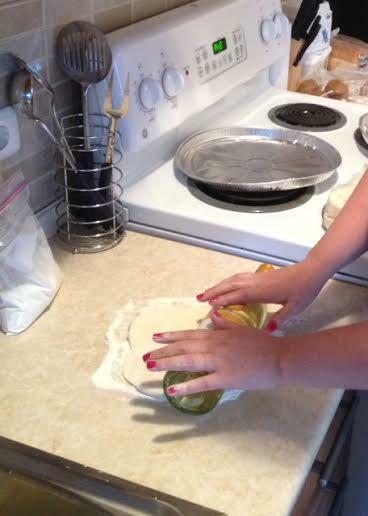 When I pulled it out the other day to make pizza, I realized I didn’t have a rolling pin. What to do? Well one thing we still have in abundance is wine! So I washed and dried a bottle, and then put a little flour on it. Voila! Even though we’re sometimes behind on pop culture and sports over here, JR was still interested in the Mayweather-Pacquiao fight. The fight was scheduled to begin around 5am local time, so he and some crazy friends planned a viewing party. It pained me to think of sending him to a party without a dish of some sort, but there was no way I was going to be awake to prepare something before he left. The bigger problem is our lack of supplies. Then, I realized a simple solution. Bacon. We stocked up on bacon during our last trip to Bondsteel, and we still have a few packages in our freezer. We cooked it and put it in a Ziplock bag (that’s as fancy as it gets these days) and I’ve been told it was well-received at the party. I mean who doesn’t love bacon? I think that’s a perfectly good reason for champagne!